ZONE is gunna have a field day with this. Dailymotion mirror, thanks to /co/ anon! Did we just see a Russell x Blythe moment? I am watching right after watching an episode of TMNT centered on Donnie and his crush on April, so my mind might be in the gutter with these thoughts. But yeah it is been establish Russell does have a closer Blythe than any of the other pets, if anything it is like Twilight Sparkle and Spike's relationship, I do get the idea his dream is to be Blythe's pet. Awesome Biskits cameo, I was thinking one second before I wonder how this blackout is effecting the Biskits and boom see it, and doesn't effect them at all, and a Scooby Doo pardoy mixed in with Ghostsbusters, this an awesome episode. 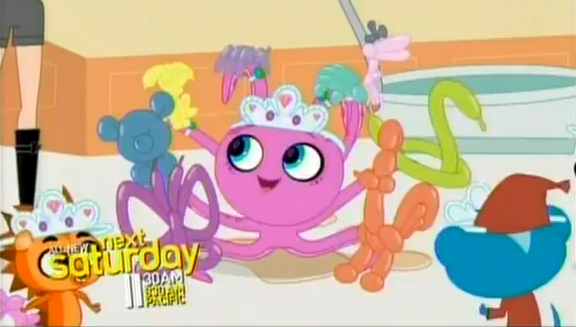 I liked the Octapus, he was funny. Someone just uploaded episode 3. BTW does the episode link actually work? Do you know if someone uploaded it on YT yet? Yes it does, but I've already uploaded it to YouTube so you might as well watch it there. do i have to download it? + What looked like it was going to take the same route as the typical "slumber party episode" in shows like this... thankfully didn't. GOOD. Seeing everyone doing slumber party things for only 2 - 3 minutes was some actually good writing there. "o" I think Russell X Blythe fans will love this episode on principle; that, and it felt good for me to just see focus on characters I actually care about, even if only a small number of them plus the usual pet of the week. "o" While Sunil/Vinnie's idiotic behavior caused the whole conflict, at least it wasn't grating (besides, who would believe these two idiots are what caused the power outage, anyway?). "o" This episode wasn't all that eventful to me, honestly- THEN AGAIN, I'll take quiet and collectively handled and executed, over crazy, yet stupid (which the episode before this unfortunately came off to me...) in a show that ultimately doesn't benefit from the kind of humor that fits in only other shows where that kind of humor could otherwise work if the timing, writing, and energy is present IMHO. Did anyone else notice that this was the first episode to not feature any of the female pet characters? Smallest cast so far for an episode of this show, I think! I think the females would of gotten in the way.